Nerendra Jeet Singh, a Sikh, went to court in New South Wales (NSW), Australia over a bicycle helmet fine. He escaped the fine, arguing that his identity and religion are of prime importance. In Queensland, Jasdeep Atwal challenged a helmet fine in court. The Sikh community has led Queensland to reform the helmet law to add a religious exemption. Sikhs have helmet exemptions in South Australia, Western Australia, Queensland and Victoria. In Victoria, Alan Todd challenged a helmet fine in court, avoiding the fine. People who challenge a helmet fine in court often escape it. In NSW, the defence of necessity allows people to break a law to avoid more dire consequences. Bicycle helmets increase the risk of accident and injury. To avoid a higher risk of accident, cyclists can choose not to wear a helmet. This might explain why the police rarely book cyclists for helmets in NSW. It is pointless harassment: most people give up cycling, those who prefer to keep riding can challenge the fine in court. Despite having one of the worst track record, Australians academics try to lecture the world about cycling safety. Yet it fits with the Australian government agenda of obfuscating the disappointing results of its controversial bicycle helmet law. This is not about cycling safety. It is about defending government policy. Professional conferences are places where people present results they can be proud of. For example when they have achieved superior outcomes. It was a surprise when academics from Australia went all the way to Finland to lecture about bicycle safety. 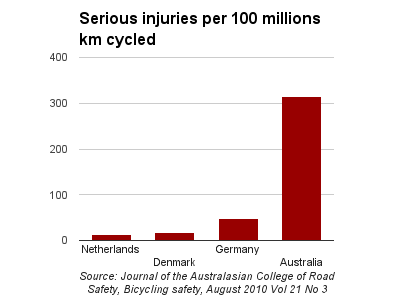 Australia is far from being a role model in cycling safety. Why would a country with a poor track record attempt to lecture others? Australia was the first country to introduce a compulsory bicycle helmet law in 1990. 27 years later, it is still controversial. Fewer people cycling lead to a less healthy population. 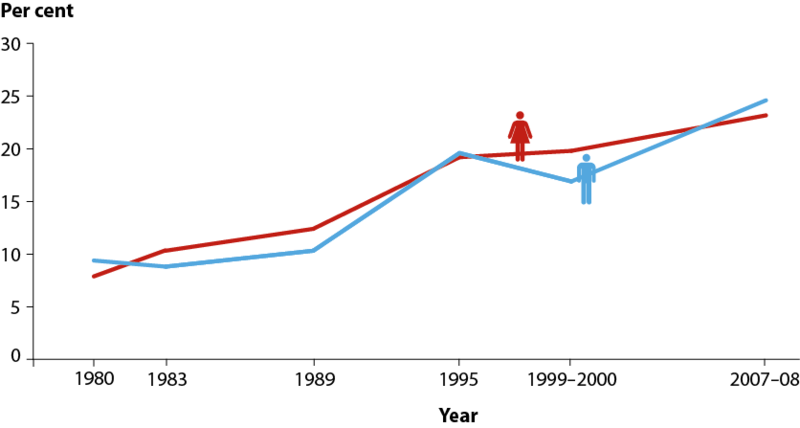 Obesity rates rose sharply after 1990. Australia is now one of the most obese nation in the world. Countries with less active transport (walking, cycling) have higher obesity rates. The cost of obesity in Australia is estimated to be $58 BILLIONS per year. If the helmet law was responsible for only 5% of obesity, that would cost $3 BILLIONS per year. Why would any country want to emulate such results? Only one country, New Zealand, has followed Australia, in 1994. Other countries have shun this policy. This policy has done more harm than good. Australian politicians have failed to admit it. Instead, bureaucrats have commissioned “studies” to defend government policy. Australian government agencies have commissioned academics to defend its controversial helmet law for more than 20 years. For example, a 1993 “study” tried to deny that the helmet law reduces cycling. A 2009 “study” tried to deny that helmets can aggravate brain injury. Generous funding rewards studies praising bicycle helmets. It is a brave academic who risks their career criticising government policy. Australian academics went to Finland full of confidence. They are rarely challenged at home. They receive generous funding for “studies” defending government policy. An example is this study, that claims the helmet law as a success. Despite rising injuries, this “study” claimed the helmet law was a “success”. How to claim “success” when injuries increase? The creative spin used was to claim that, as head injuries did not rise as much as arm injuries, the helmet law was a success. The injury rate tripled after the helmet law. That’s labelled a “success”. This “study” was conducted by the academics who presented in Finland. The presentation in Finland was widely covered in the Australian media. Most of the Australian media stills defend the helmet law based on theoretical benefits, ignoring actual results. The academics who presented in Finland also claim that the helmet law did not reduce cycling. The inconvenient data includes the national census from the Australian Bureau of Statistics. According to the academics to who presented in Finland, the national census from the Australian Bureau of Statistics suffers from “convenience sampling”. Inconvenient data can be dismissed. When pressed for evidence, their “better quality data” turned out to be hospital data. Hospitalisation data is “better” data to measure cycling levels than cycling counts? This beggars belief. 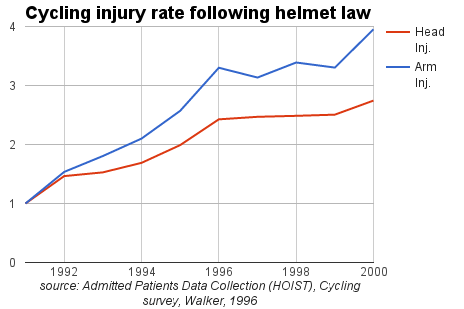 Helmet fanatics own study does show a sharp increase in injuries after the helmet law was introduced. 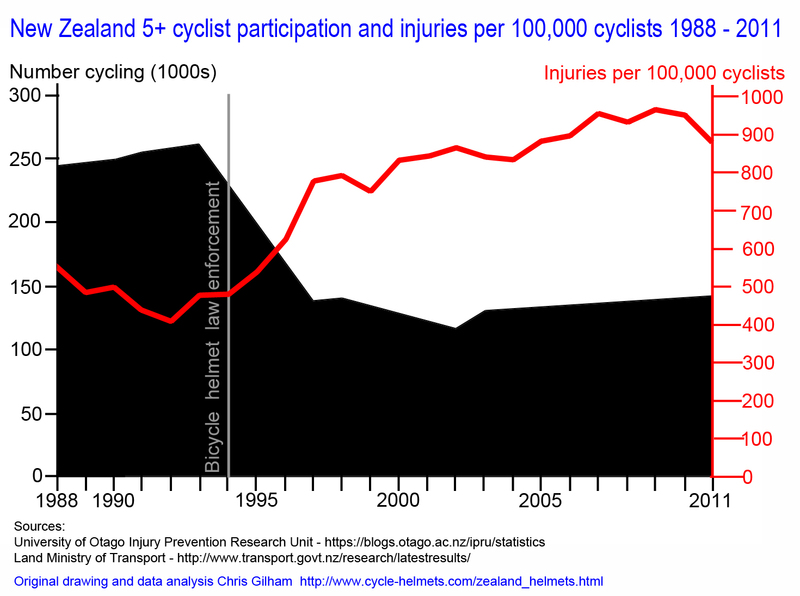 Yet rising injuries does not mean that there are more cyclists. This can be due to more accidents. The evidence that the risk of injury has increased after the helmet law has been ignored. Brave researchers who have the courage to expose government funded propaganda face the wrath of those who feed on government funding. The government-funded academics presenting in Finland have aggressively attacked Elvik. The academics who presented in Finland were from the University of New South Wales (UNSW). UNSW has earned generous funding for “studies” defending the helmet law for years. Between 2006 & 2009, It earned at least $248,000 in funding for bicycle helmets “studies”. Government funding was channeled through the Australian Research Council. The underlying University department is primarily funded by government agencies. Such conflicts of interest are not disclosed. Government propaganda is not new. It is rarely exposed on an international stage though. Should we we let governments get away with deceit? There is more at stake than it seems. The consequences of failing to act against government deceit can be dire. Consider the deceit behind the invasion of Iraq. This has cost hundreds of thousands of lives. Millions of people are still suffering from the consequences. Governments can do a lot of damage. When we let governments get away with deceit, the damage can be much worse. We end up paying the bill. Wearing a safety device creates a feeling of safety. This makes us less cautious. This well documented behavior is called risk compensation. We tend to take more risks when wearing safety equipment. Safety experts recognise the role of risk compensation. Risk compensation is an unconscious phenomenon. We may not be aware of it. Yet it affect the way we ride, the way we approach risks. Risk compensation also affects motorists. Motorists tend to be less careful around helmeted cyclists. Drivers assume helmeted cyclists are “protected”. Another subtle aspect of risk compensation is that we tend to ride faster. In case of an accident, the higher speed results in more severe injuries. In the event of an accident, helmets increase the risk of the head hitting the road. Helmets increase the volume/size of contact area of the head. Helmeted riders are more than twice as likely to hit their head in an accident, with more impacts to the sides. Post-crash studies found that most helmets show impacts to the side,where a bare head is protected by the shoulders. A 1988 study reports that helmeted riders hit their heads seven times more often than un-helmeted riders. In 1960, people believed that brain injury was due to linear acceleration, from the head hitting a wall for example. This belief has shaped the design of bicycle helmets. Helmets were found to amplify rotational acceleration to four times higher than the tolerable maximum. The volume of a bicycle helmet amplifies rotational acceleration to dangerous levels where severe brain injury can occur. Contrary to popular belief, helmets are not designed to protect against brain injury. However, they can increase rotational acceleration, causing severe brain injury. This might sound like a load of rubbish to cyclists who wear helmets. Some believe their helmet saved their life. Few consider they may have fewer accidents without a helmet. Cycling injuries rose dramatically after a helmet law was introduced in Australia. The rate of cycling injuries tripled after Australia introduced a helmet law. You might feel safer wearing a helmet. However that doesn’t mean you are safer. Most submissions to the inquiry requested a review of the bicycle helmet law. The senate inquiry held hearings on the bicycle helmet law on the 16th of November 2015. This hearing included testimonies from helmet law supporters. The inquiry released its interim report in 2016. “CHAIR: Does Australia have a significantly lower rate of serious head injuries and deaths amongst cyclists than other countries in the OECD? The self-appointed “experts” are fierce believers in the helmet law. Yet they don’t know whether the policy works. Are helmet fanatics unaware? or are they reluctant to acknowledge results that challenge their beliefs? Helmet fanatics make bold claims like “helmets reduce risk of serious injury or death by about 60 per cent”. If that was true, Australia’s serious injury rate wouldn’t be so high. Wearing a helmet can make people feel safer. Helmet fanatics seem unable to understand the difference. Helmet fanatics bold assertions indicate that they are rarely challenged. When pressed for evidence, they retreated to evasive or misleading statements. “CHAIR: We do have some evidence. We have evidence relating to participation in cycling. We have evidence in relation to cycling accidents. One of you—I cannot recall which—said that cycling participation has not declined following introduction of mandatory helmet laws, and yet even here in Victoria 679 fewer teenage cyclists were counted in identical pre- and post-law surveys, but the number of teenage cyclists wearing helmets increased by only 30. Doesn’t this suggest that the main effect of the law was to discourage cycling rather than encourage helmet wearing? 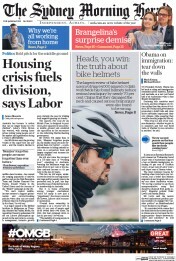 CHAIR: Fewer cyclists, only 30 more helmets over pre and post? What does that suggest to you? Prof. Olivier : If you are trying to estimate the prevalence of people cycling, you do not do it by standing on the street corner and counting. That is not a proper statistical method for estimating prevalence. We would not do that with infectious diseases. We would not do it with other diseases or any other health related thing. We would not just stand on a street corner and ask people: ‘Do you have HIV? Yes or no?’ and then do that over several years and count the number of times someone says yes. That is not how it is done. 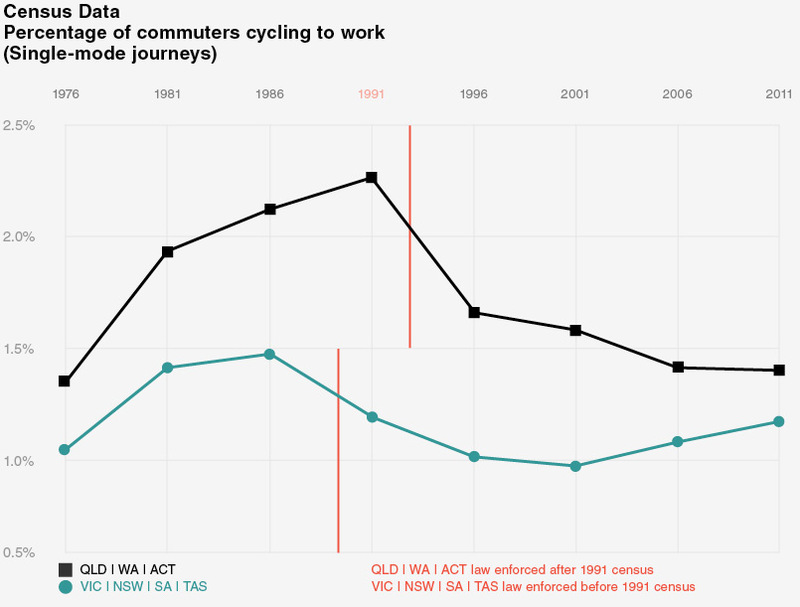 It is very weak data and, from other stuff that we have done and I have done with colleagues here, we know that, as the data has got stronger—there is not any ideal data around the time of the helmet legislations across the Australian states—and better in terms of quality, we do not find big drops in cycling. We do not find any significant changes in cycling. CHAIR: But others do, so I am struggling to understand how you can be so positive. CHAIR: What data? Which data set are you relying on? So, let’s denigrate cycling counts as a method of measuring cycling levels, then claim “we have better data”. Yet the evasive answer fell flat on its face when pressed for evidence. One of the arguments from helmet choice advocates is the Northern Territory. The helmet law has been relaxed. It is rarely enforced. The helmet wearing rate is the lowest in Australia. Cycling to work is 3 times the national average. Cycling injuries are below the national average. Such evidence shatters helmet fanatics claims of high traumatic injuries should the helmet law be relaxed. How to denigrate the evidence from the Northern Territory? “Senator CANAVAN: Okay. I suppose that we do have some degree of competitive federalism in Australia, where the Northern Territory have relaxed their laws. I am not sure if you are familiar with this but the evidence to us is that apparently they have allowed bicycle use without a helmet on footpaths, and I think on low-speed roads as well. Do you have evidence that that has led to an increase? They did that in 1994 or some such—in the mid-1990s, so it was some time ago. Has that led to a marked difference in the quantum or severity of brain injuries in the Northern Territory as a result of cycling, relative to the rest of the country? Is there any evidence there? Prof. Ivers : No, overall. Prof. Ivers : Yes, that is right. CHAIR: Not specific to bicycles? 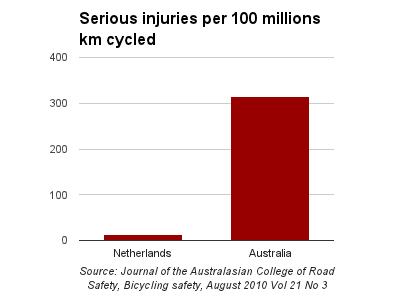 So, it is worth noting an irrelevant statistic that misleads about cycling safety in the Northern Territory? Such misinformation does little to foster an informed debate. Bicycle helmets are not designed to protect against brain injury. This is inconvenient for helmet fanatics. Their rhetoric exploits fears of brain injury. Without it, the emotional appeal for a helmet law dwindles. “CHAIR: Well, the evidence we heard was that that is not likely to be the most typical injury incurred when you fall off your bike—that you are more likely to have a twisting injury. That was the suggestion. It is odd to attempt to denigrate a phenomenon accepted worldwide as “Curnow hypothesis”. What is the denial based on? A study that is an offshoot of this misleading study. This “study” was commissioned to defend the helmet law. It sets up unrealistic conditions. It makes unwarranted claims by generalising the results beyond the laboratory artificial set up. Helmet manufacturers have been sued for selling helmets that fail to protect against brain injury. They have made prototypes of different designs that might reduce rotational acceleration. Helmet manufacturers don’t deny that bicycle helmets are not designed to protect against brain injury. Yet, helmet fanatics claim that their denial is “not in dispute”. ​Such misleading and deceptive conduct is not new. it was attempted in this study that tried to deny that bicycle helmets can aggravate brain injury. The “study” used hard shell helmets, then magically attributed the results to soft shell helmets. For how long will these tricks keep working? Why are these two devices given the same name? Imagine a drug manufacturer introduces a new medicine it calls new aspirin. Yet the new aspirin is only 1% as effective as current aspirin. There would be an outcry. It is misleading to give the same name to a product that isn’t as effective. The drug manufacturer would have to use a different name to avoid misleading consumers. Yet, in the 1980s, helmet manufacturers marketed “bicycle helmets”. They were essentially a piece of polystyrene. They provided much less protection than existing helmets. Yet the manufacturers got away with the misleading label. Why do they have the same name? Helmet manufacturers. Labelling a polystyrene hat a “helmet” suggests it provides significant protection. It becomes a safety device. A polystyrene hat couldn’t sell for much more than $10. A helmet can sell for $100. There are huge profits in selling bicycle helmets. 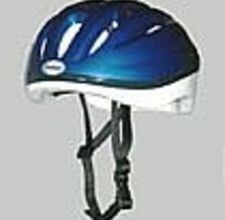 In the late 1980’s, bicycle helmets were the most profitable of all types of helmets. Helmet manufacturer were keen to expand this market. They used their profit bonanza to increase market size. They commissioned “studies” claiming that bicycle helmets protect against brain injury. They lobbied governments for a helmet law. Their efforts lead to the introduction of a bicycle helmet law in Australia. Politicians like to be seen “doing something” to improve safety. In Europe, cycling safety has improved by protecting cyclists from motorised traffic. This reduces accidents, but requires effort and investment. In countries where there are few votes in cycling, politicians can take shortcuts. They can pretend that polystyrene hats make cycling “safe”. Imposing a mandatory bicycle helmet law sounds like a plausible policy. If the policy was called “mandatory polystyrene hat”, it would be obvious it is a fake safety measure. Effective politicians master the art of peddling what seems plausible. Policies don’t have to work to attract votes. They only need to be plausible to appeal to enough voters. Language affects our perception. We can be tricked by mis-labelling an issue. For example labelling a problem an “opportunity” makes it feel less painful. Labelling a polystyrene hat a “helmet” makes it seem like a safety device. Why isn’t there any oversight? Unlike medicine, road safety suffers from poor oversight. Companies can market products with misleading names. “Road safety” bureaucrats are mostly unaccountable. They can produce policies that do more harm than good. There is no independent auditor that checks the policies effectiveness. In medicine, drugs have to go through diligent trials. They look for side effects, ensuring the drugs does no harm. Road safety policy lacks such safeguards. “Road safety” advertising. This often uses fear mongering to scare people. When we are afraid, we seek safety. This is what the policy promises. The advertising finds an emotional way to associate the government policy with “being safe”. It doesn’t to have be true. It only has to be plausible. With enough emotional manipulation, any plausible policy can build up popular support. Commissioning “studies” to defend the policy. A bureaucrat offers generous funding to conduct a “study” related to a government policy. If the study concludes the policy is ineffective, the academic is unlikely to get further funding. Most studies conclude that the policy is beneficial. Most of these studies lack scientific discipline. A meta-analysis of drunk driving prevention and control literature from 1960 through 1991 identified 6500 documents, of which only 125 passed minimal standards of scientific rigor and quality. Less than 0.2% of the “studies” passed minimal scientific standards! Lacking scientific discipline, studies make invalid claims defending the policy. This is junk science. It misuses science for political purposes. These “studies” are used to denigrate critics who point out the policy ineffectiveness. They are an obfuscation tool. Using such tricks, policies that do more harm than good can remain in place for years. This keeps the bureaucrats in their cushy jobs, while the politicians get the votes. The bureaucrats and politicians do not suffer from the consequences of their mistakes. We do. This could not happen with independent oversight. If it’s a duck, call it a duck! Vested interests benefit from the confusion between helmets and polystyrene hats. Yet, the public does not benefit from being mislead. What we can do to reduce the confusion is to insist on a name that does not mislead. When it’s a duck, call it a duck. When it’s a polystyrene hat, call it a polystyrene hat. In this inquiry, our concern is the safety of cyclists as road users, having regard to the costs of injury and death to them. We focus here on the design standard for bicycle helmets, made mandatory by federal trade practices legislation and administered by the ACCC, and its adequacy for supporting the nationwide regime of compulsion to wear a helmet. References to pages, tables and figures are to my chapter, “Bicycle helmets: a scientific evaluation”, which forms part of this submission. Fear of fatal or chronically disabling head injury has led many cyclists in Australia to wear helmets, and to compulsion of it for the purpose of reducing hospital and other public costs of accidents. Such injury mainly occurs to the brain, especially diffuse axonal injury (DAI). Protection of one’s own person without harming others is by long tradition an individual choice. Law to compel it for the purpose of reducing fatal or disabling head injury therefore needs, first, evidence of increasing risk of serious casualty to cyclists, but from 1986 to 1989 it fell (see Figure 1). The second need is evidence that helmets protect the brain. Such evidence was not provided before adoption of compulsion, but was and is needed to underpin the mandatory standard that defines the helmets to be worn. With emphasis on death and permanent intellectual incapacity from head injury, the Royal Australasian College of Surgeons (RACS) urged compulsion to wear a bicycle helmet upon a federal parliamentary inquiry in 1977. The inquiry recommended that the possibility of compulsion should be kept under review, precedents being motorcycle helmets and seat belts. By 1984 and resumption of the federal inquiry, belief in the efficacy of helmets against brain injury was widespread and other medical bodies and some cyclists’ groups had added their support for compulsion. The inquiry’s final report in 1985 recommended it, but recognised that, to support it, a mandatory standard was needed to assure the public of the efficacy of helmets. The report also recommended research on whether helmets could be better ventilated and lighter, such as by dispensing with their hard shells. But the research, by Corner et al (1987) did not simply endorse such revisions. It drew upon research findings that the main cause of brain injury is not a direct hit to the head, such as by a bullet or a falling stone, but rotation from an oblique impact. Corner reported that the standard tests were deficient in not testing for reducing rotation; worse, it found in experiments that adding a helmet to a dummy head can increase it – a finding corroborated in the USA in 2003 and in the UK in 2007. Corner suggested that helmets should have very stiff shells with a low impact sliding reaction, yet the standard was amended to allow soft shells. These are more acceptable to the public, making it easier to compel their use, but they tend to disintegrate on impact. And in Australia, the risk of fatal head injury to cyclists increased after the helmet laws, compared to other road users. But successive mandatory standards since 1990 take no account of these facts. An influential factor in adoption of compulsion as federal policy in 1989 was a prominent surgeon’s advice direct to Prime Minister Hawke of savings in hospital and other costs if brain injury and permanent disability to young adults and children were prevented. The final factor was a national survey that found 84 per cent support for compulsion of all cyclists, rising to 93 per cent for children. By offering additional funds for roads tied to its “black spots” program, the Federal Government secured the agreement of the states and territories to pass legislation for compulsion. Official reviews were made in 1999 and 2009. In submissions to them, we argued that “the standard neglects the major cause of brain injury, rotation of the head following indirect impact … driven more by helmet suppliers’ technology than scientific knowledge”. Indeed, the Treasury’s Regulation Impact Statement upon the 1999 review says that “bicycle helmets are designed to protect against impact injuries to the head and brain, and would appear to provide little if any protection against certain other types of brain injury… issues relating to helmets in head protection range to exacerbating the extent of rotational brain injury.” Then that critical issue is left up in the air; yet the official media release claims that helmets provide the necessary head protection. For evidence of the efficacy of bicycle helmets to underpin the mandatory standard, Australian authorities rely upon a ‘meta-analysis’ of 16 studies to the head, face or neck which the Australian Transport Safety Bureau (ATSB) published as Road Safety Report CR 195 in 2000, and in Accident Analysis and Prevention in 2001.. Of the four studies done in Australia, three were of data before compulsion and one after it. Eight of the studies were USA-based. 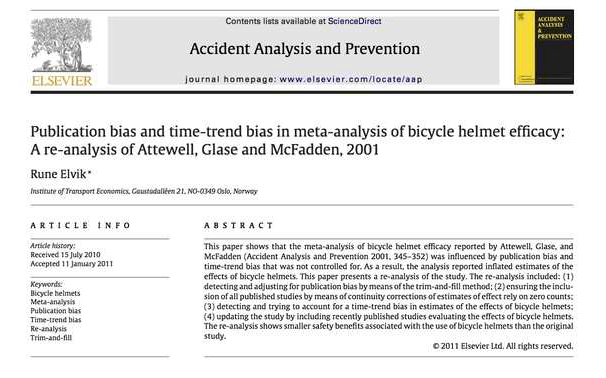 In articles published in AA&P in 2003 and 2005, I argued that the meta-analysis and a similar review by Thompson, Rivara and Thompson (TR&T) of the USA do not provide scientific evidence that bicycle helmets reduce brain injury and, indeed, have potential to aggravate it. In a response in 2006, Hagel and Pless from Canada criticised my 2005 article. I rebutted the criticism, and in a subsequent debate in AA&P, which included TR&T, I had the last word – see references 57 and 78-86 in my book chapter “Bicycle helmets: a scientific evaluation” (submitted in hard copy and available online). ATSB explicitly declined to take part in the debate. Its letter of 5 April 2007, scanned copy subjoined, stated that “most of our research projects are carried out by external research professionals. We consider that prime responsibility for each project rests with the authors of the work … and we do not, as a rule, enter into public debate about the merit of individual studies”. This, despite one of the three authors of CR 95 being an officer of ATSB and it being published under the banner of the transport portfolio. The present state of evidence on the efficacy of helmets against brain injury is therefore marked by uncertainty. Laboratory experiments indicate little efficacy and so do national data for deaths by head injury before and after the helmet laws. But the important resources of diagnoses of DAI in state and territory coroners’ reports and of persons treated in hospitals have not been tapped for the statistical analysis that might well provide the robust evidence needed to support compulsion. Fear of fatal or chronically disabling head injury has led to many cyclists in Australia wearing helmets, and to compulsion of it for the purpose of reducing hospital and other public costs of accidents. As such injury occurs to the brain, especially DAI, the helmet laws need the support of sound knowledge that helmets reduce it. The cause of DAI is rapid rotation of the head from oblique impact, but the mandatory standard does not test for it. Worse, experiments with dummy heads indicate that a helmet is likely to aggravate it and statistics suggest an increase in the risk of death by head injury after the helmet laws. Therefore, the mandatory standard is inadequate to support the helmet laws. It is suggested that the inquiry should recommend to the Federal Government that it initiate an independent and open review of the adequacy of the mandatory standard. Such a review should be undertaken promptly and carried out in an open way to ensure full public scrutiny. Thank you for your letter of 14 February 2007, to the Executive Director of the Australian Transport Safety Bureau (ATSB), concerning research on the efficacy of bicycle helmets. Before addressing the specific matters raised in your letter, I would like to make some general comments about the ATSB’s role in Australian road safety. The ATSB endeavours to support the development of road safety policy by: facilitating national agreement on strategic road safety priorities; collecting, analysing and disseminating national road crash data; and undertaking or funding road safety research projects. While the ATSB places a high value on good road safety research, our capacity to contribute directly to the research pool is limited by a modest annual budget and a small staff base. There are many competing demands on our resources and we are necessarily very selective about the work we undertake. Most of our research projects are carried out by external research professionals. The ATSB provides oversight and direction, and exercises a degree of quality assurance over the conduct of the research. However, we consider that prime responsibility for each project rests with the author(s) of the work. As a matter of standard practice, the ATSB publishes and disseminates all its commissioned research reports. In doing so, we recognise that these reports will be exposed to professional scrutiny and, potentially, to public criticism. However, we regard this is as a healthy process and we do not, as a rule, enter into public debate about the merit of individual studies or the conclusions drawn by their authors. The officers involved in the 2000 study no longer work for the ATSB, however I am advised that the review was undertaken by well-qualified analysts and that the report was widely received as a positive contribution to the research on bicycle helmet efficacy. The ATSB has not undertaken a systematic review of the literature since the completion of CR 195. We may do so in the future if circumstances permit, and I thank you for drawing attention to your own articles on the subject. The National Road Safety Action Plan 2007 and 2008 was developed jointly by federal, state and territory transport agencies, with input from the police and a number of international road safety experts. The ATSB coordinated this process, but the actual content of the Action Plan reflected the consensus views of all contributing parties. To my knowledge, the text highlighted in your letter was not based on any specific advice provided by the ATSB. A nation wide regime of compulsion for cyclists to wear helmets in all public places has been in force since 1992, as a result of the Hawke government offering to the states and territories additional funds for roads: the so-called black spots program. Because the helmet laws take away the long standing civil liberty of cyclists or their parents to decide how to protect their own persons and place that responsibility upon governments, it is up to governments to have very strong evidence that wearing a helmet will be beneficial in terms of reducing the risk of fatal or disabling head injury. Such injury occurs to the brain. The stated purpose of the Federal policy of compulsion is to minimise deaths and costs of hospitalisation resulting from cycling accidents. Government’s often say that helmets protect and that they save lives and to support this they cite statistical evidence from case controlled studies and statistics before and after compulsion, but the statistics relate to head injuries in general most of which are of low severity and not intellectually disabling. Focus of attention on severe brain injury shows a different story. There is good reason to expect that wearing a helmet is likely to increase the risk of it.